I Spy Animals: So what is a black panther, anyway? So what is a black panther, anyway? Black panthers are any member of the big cat family (roaring and non-roaring) that are born with an entirely black or very dark pelt. They are mostly found among leopards and jaguars. So a black panther isn't a certain species of cat, but a color. 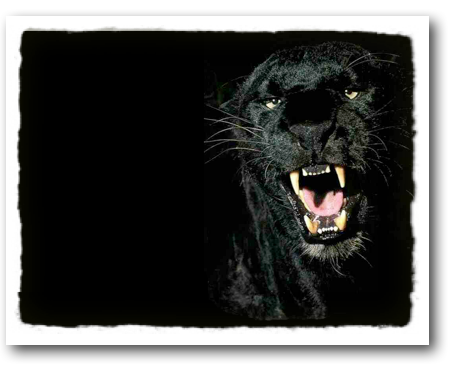 For example, a black panther in South America would be a black jaguar. In Africa and India, it would be a black leopard. What about black cougars,tigers or cheetahs? Well, there's some evidence of black or melanistic tigers, but almost none on the other two big cats. 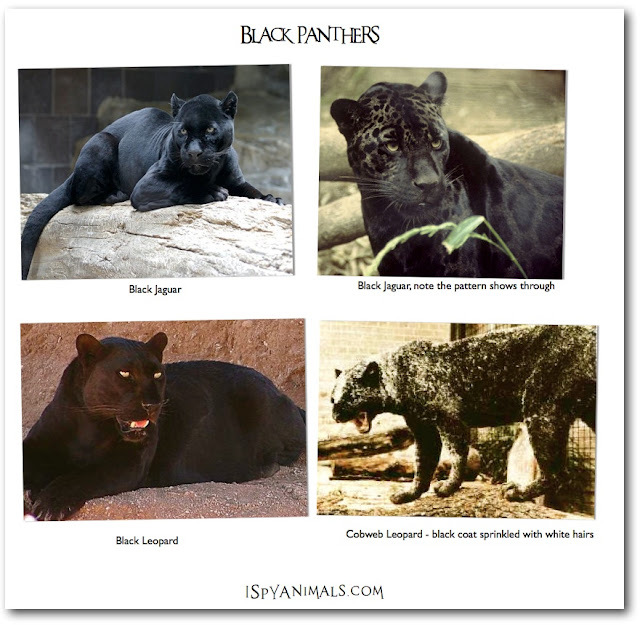 Let's look at the most common black panthers: jaguars and leopards, below. Beautiful! I never knew this! Very cool. I just LOVE all your facts. They often amaze me. PS- If you take your fingers and cover the fangs of the panther at the top his ferociousness simply dissipates! :) try it. We got a laugh! "For example, a black panther in South America or Asia would be a black jaguar" - I think you might have confused Asia with North America, there are no jaguars there! You are so right! I changed my post to reflect your comments. Thanks! This is so cool! The black panthers are so fierce. I was kinda hoping you’d say that black lions also exist but well, never mind.